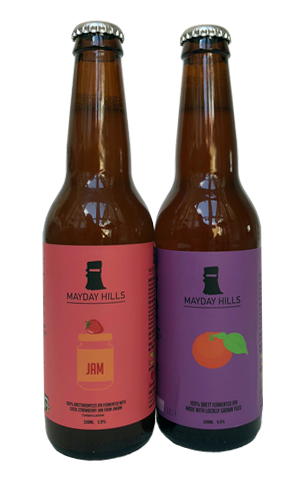 The Bridge Road brewing team continues to plunder the bounty of its local region for the Mayday Hills series, with JimJam Foods and Mountain Yuzu the latest co-conspirators welcomed aboard. The former provided strawberry jam, which was added to a light farmhouse ale that had been fermented with Brettanomyces in the brewery's foeder; lactose (milk sugar) was introduced along the way too. Little surprise, then, when you're met with big, sweet, sugary jam aromas, supported by a little citrus. There's a Bretty, hay like dryness running through it from start to finish too, undercutting the sweetness, and, while the lactose adds a fatness to balance the beer's acidity, it stops well short of being the sort of dollop of sweetened cream you'd pile onto jam and scones. One of the most enjoyable Mayday Hills releases to date, in fact. As for Yuzu, it's built upon an IPA base and features as-yet-unnamed Aussie hop variety HPA-016. Aroma wise, this fruits of the foeder delivers cooked or ripe citrus on the nose, with lemon and lime trying their best to smother the Bretty characters lingering within. The hops are more potent on the palate, with citrus zest, a little resin and what appears to be blackcurrant and liquorice lurking inside the cloudy, deep copper liquid. NB: As a means of supporting strawberry farmers affected by the recent incidents, Bridge Road Brewers is shouting a punnet of fresh strawberries to the first four lucky drinkers to purchase a four-pack of Jam at the listed outlets. NB II: You can join Bridge Road for a Mayday Hills Masterclass at Beer DeLuxe Hawthorn on October 18; details here.